Are you trying to find a vehicle to take you around in Salem and help you feel proud each time that someone spots you in it? 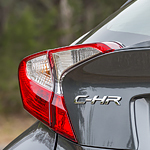 The C-HR has an exterior design that will give you confidence. This Toyota vehicle is a popular subcompact SUV choice and something that is designed well. The headlights of the Toyota C-HR are different from what you will find on other vehicles out there. This vehicle stands out because of the cluster lights that it features at its front. The bright halogen headlights will illuminate the road before you and help you draw attention. The door handles of the Toyota C-HR help the vehicle to have a sporty look and they are also easy to use. You can easily open the doors of your vehicle because of the way that these special door handles are designed, and you will appreciate all that they add to the vehicle's appearance.